Oh man, oh man! Has anyone else received discrimination for being a food blogger? Today at my boyfriend's favorite restaurant, the table next to us wouldn't stop talking about how weird I was for taking pictures of everything and commented how they hated tourists and just wished they could throw chilies at them. Later on we discovered that they were from LA and in comparison....I was born here. By the end of the night, they too were Instagramming and taking photos of their dishes with their iPhones! They also made a couple of disparaging comments about how my boyfriend and I could "afford" to go to such a fancy place dressed the way we were. It made me terribly uncomfortable and made for a more than unpleasant dining experience. Luckily for me, I wasn't alone and the food was tasty. I guess...I always just wonder why people can't be nice to each other. 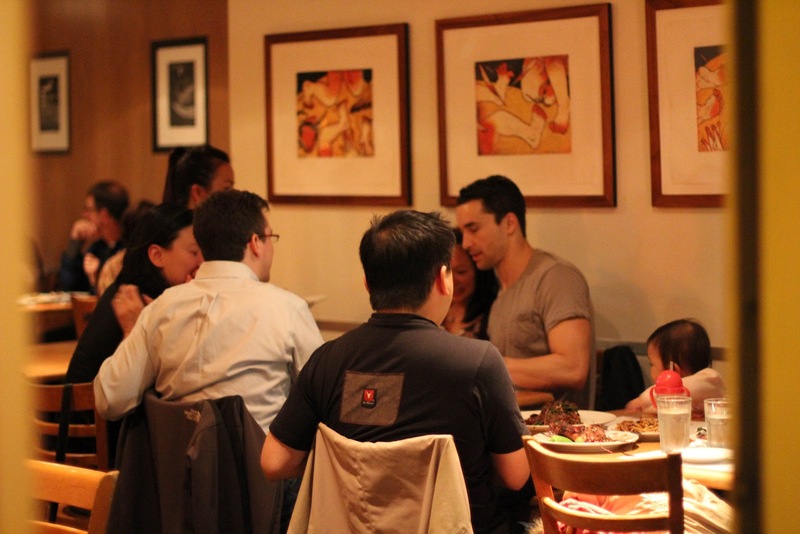 The house is a small, casual restaurant on Grant Avenue in San Francisco that serves "Asian American" food. I was really excited to try this restaurant, because it's my boyfriend's favourite and he felt really strongly about it. Usually when it comes to eating dinner together, it's always an awkward battle of "I'm not feeling like anything in particular, what do you feel like?" "Oh nothing, what do you feel like?" Haha, but this time boyfriend was like "We're goin' here." The restaurant actually sort of reminded me of a small shop, instead of a restaurant. The entirety of the floor space was taken by guest seating. The menu was only one page long, divided evenly between the appetizers and and the entrees, with supplementary seasonal special options for the appetizer, entree, and dessert. The first thing I noticed about The House it was very small and seating space was incredibly limited. If you want to dine here, I highly recommend reserving a table in advance. The decor was clean and simple and there were no booths for large parties, but instead the entire restaurant was filled with tables that were able to seat two to four patrons at once. The staff is less like a well oiled machine and more like a bunch of ninjas. Our waters were refilled, our orders were taken, and our food was delivered, but after completing all these tasks the waitstaff disappeared into the shadows. For the most part, my boyfriend and I had a very enjoyable time to ourselves on one of our first "date nights" in a long time. The one drawback I would have to say is that there is really no privacy, the tables are really spaced closely together, and there's a lot of sound pollution within the restaurant. You have to raise your voices a bit to converse with your table mates. The House staff gave us a little freebee to tie us over until we finished reading the menu. 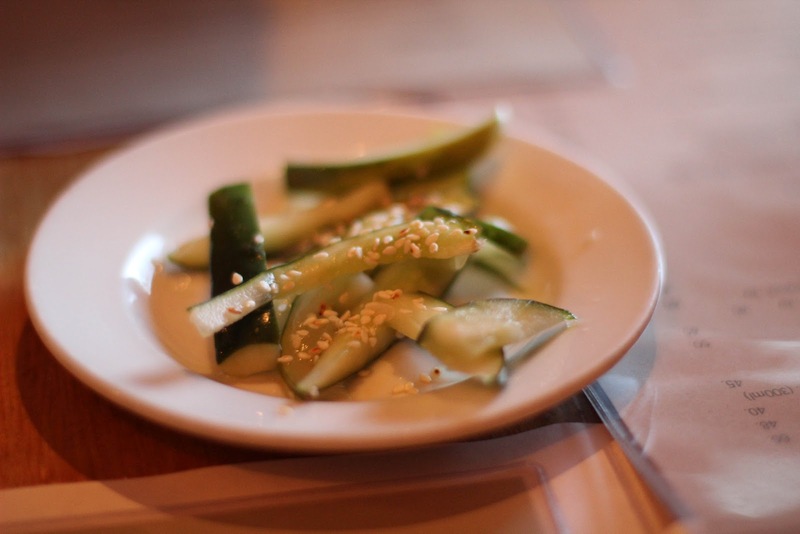 It was pickled cucumber with some toasted sesame seeds thrown on top. It was very, very, very tart and had more of an unadulterated "vinegar" flavor than the usual briny, sour flavor that pickling usually imparts onto veggies. I've heard that sour things get the appetite going and I was really excited to start the rest of the meal. 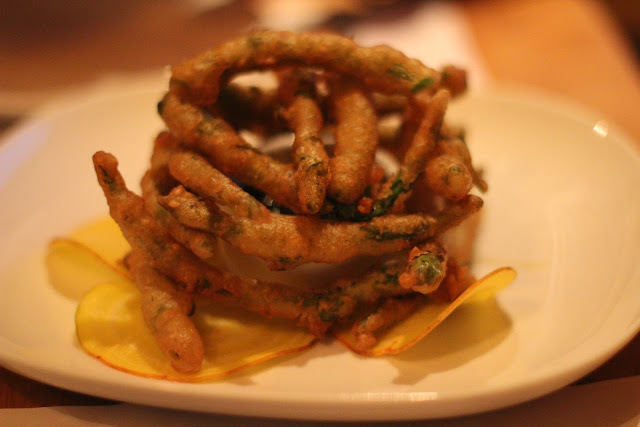 This was the appetizer that boyfriend was like "We're getting this." That was that! I have I was a little thrown off by this appetizer's description on the menu. I'm not a terribly big fan of green beans (steamed, blanched, stir fried, etc.) and I much prefer them as a side,but I have to say I wasn't disappointed. 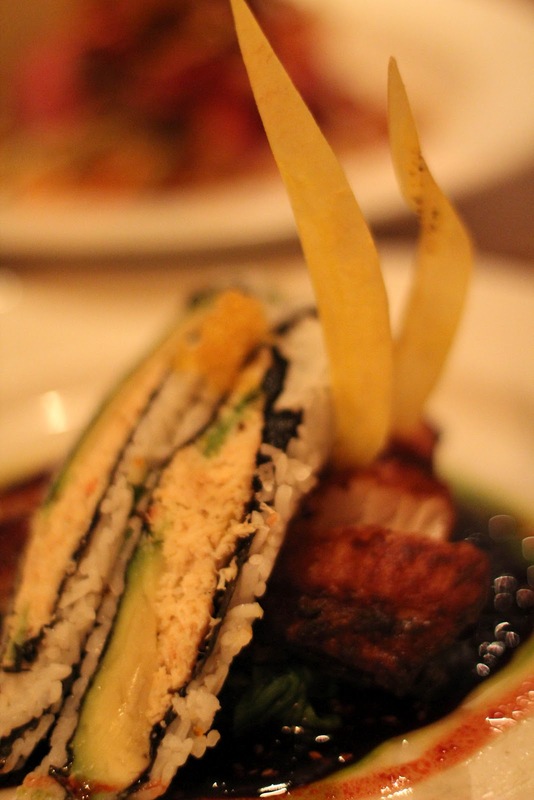 This dish was also probably one of the most popular off the menu and I saw a stream of criss-crossed bean towers emerge from the kitchen and brought to almost every table. 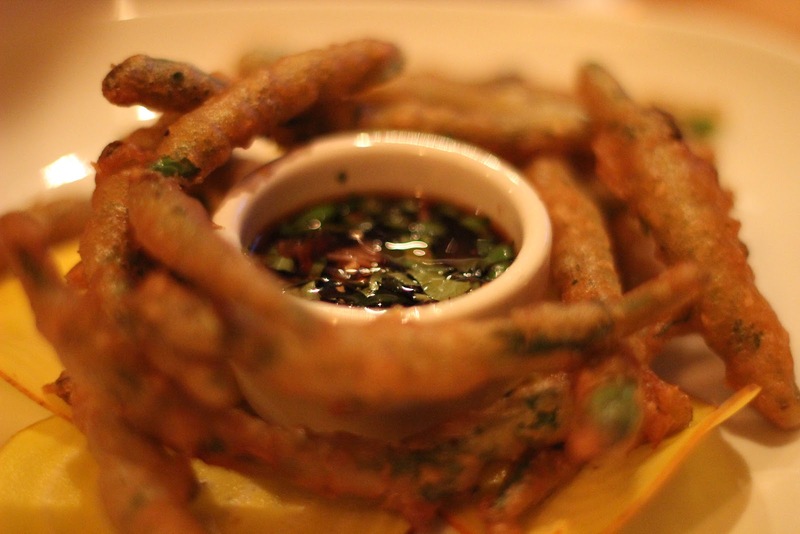 As you can probably tell from the picture above, the tempura was like a light flour exoskeleton to the green beans and served as a wonderful complement to the fresh, firm green bean "innards." The sauce was so good and paired with the tempura perfectly. Surprisingly, I could taste the sharpness of the ginger mingling with the tartness of the vinegar and the combo cut whatever oiliness was left within the tempura casing. There's a good reason why every table ordered it and after finishing our serving I really was craving more. Both the boyfriend and I were sort of disappointed with this particular appetizer. After all the title made it look so promising. 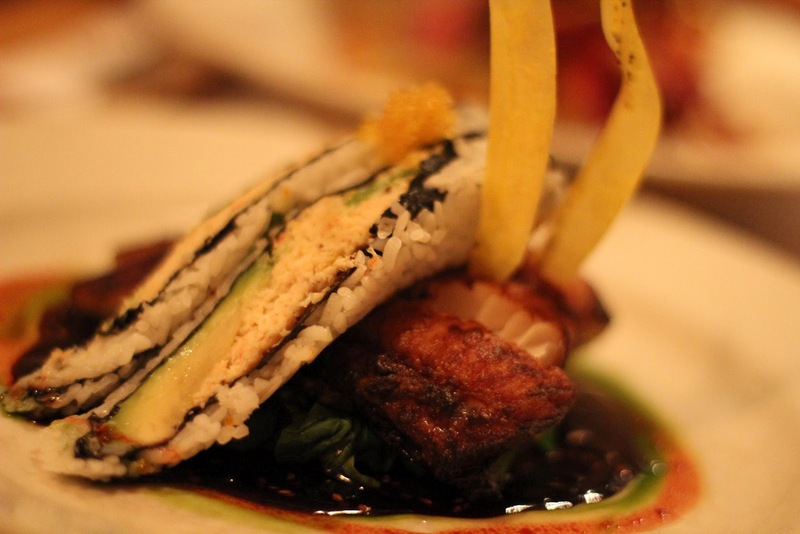 The inclusion of charred baby octopus (yum) and the sinfully delicious crispy pork skin (double yum!) really piqued our interests and we were enticed to order salad dish because we needed some vegetables in our diet so we didn't get scurvy. What you see in the photo above is an individual serving on my plate, but if you multiply my serving by four and imagine the salad in a bowl that's how the dish was presented. I was hoping for really lightly diced pieces of baby octopus, but you really had to hunt for the pieces hiding between all the bits of shredded veggies. The salad itself was also very vinegar-y, not surprising from a vinaigrette, but instead of a tossed salad I felt the flavours in this dish were more reminiscent of the pickled vegetables that come inside a Vietnamese bánh mì sandwich. The predominant flavors were sweet and sour and I didn't really taste any "kick" from the red chili. 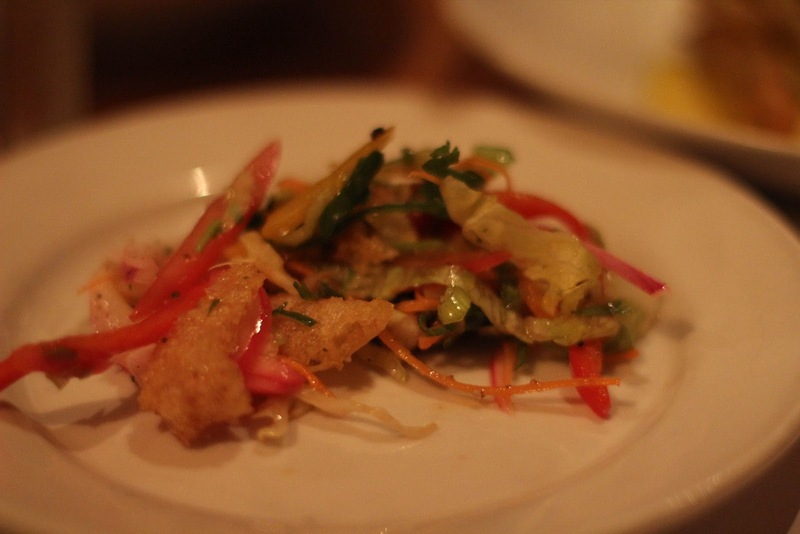 The crispy pork skin was delicious, but if you throw bacon or crispy pork skin on anything it usually has the propensity to be pretty good. Overall, boyfriend and I were a bit disappointed with this dish. This is what boyfriend says he gets every time he comes here and honestly, I can see why. The angus steak was a very tender medium rare, that was juicy and succulent. 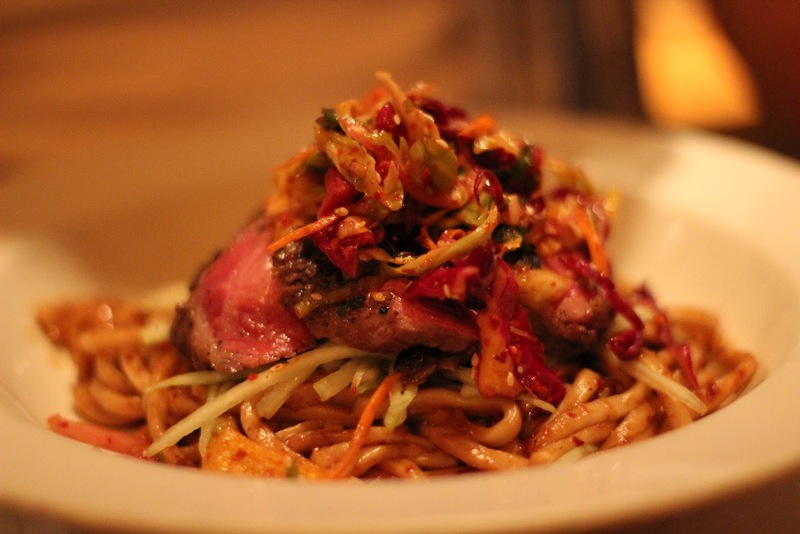 The steak mixed well with the kimchi and cucumber slaw that was presented on top of the dish. The slaw had that sweet spiciness that's common in Korean dishes, the sweet spicy, as opposed to a burning, painful one and I really liked the combination of the starchy udon with the crunchy slaw and the tender, juicy meat. The udon noodles were well done and had a nice bite with a sort of "al dente" chewiness that was really addictive. I didn't really taste the wasabi, which was strange because from the name is seemed like wasabi was a key component to this entree, but I liked the dish the way it was. I feel like wasabi might be a little too acrid for all the components within the noodles. When the waitress was talking about the three daily specials they had for the night, it was to loud in the restaurant I couldn't really hear her. However, from the scant descriptions that I did hear I picked up a "black cod braised in miso" dish and that's when I made my decision. We ordered immediately after. The black cod did not disappoint in anyway shape or form. The fish was moist and delicious and blended with the miso crust perfectly. The almost buttery nature of the black cod was complemented by the many sauces below: which included a sweet hoisin sauce, red chili oil, and wasabi oil. All this was placed upon a little bed of "gai lan" with some shaved fried plantains for decoration. The only real "cons" about this dish was that I felt the wasabi oil was really, really strong. When I was cutting the fish into pieces I would inadvertently load the fish up with so much wasabi oil, by scooting the fish off its safe bed of greens into the sauces below, that it really, really cleared out my sinuses every time I took an overly large bite. The California rolls were made with real dungeness crab and sweet, fresh avocados, but the roll sort of seemed out of place on the plate. Perhaps I just loved the fish so much that I just wished there was more of it instead of the "starch filler" California roll. Usually my boyfriend out eats me and we have to take some of our dinner home in doggie bags, but this time we finished everything on the table and were so completely sated we didn't have room for dessert. It was lovely and I had a great time. 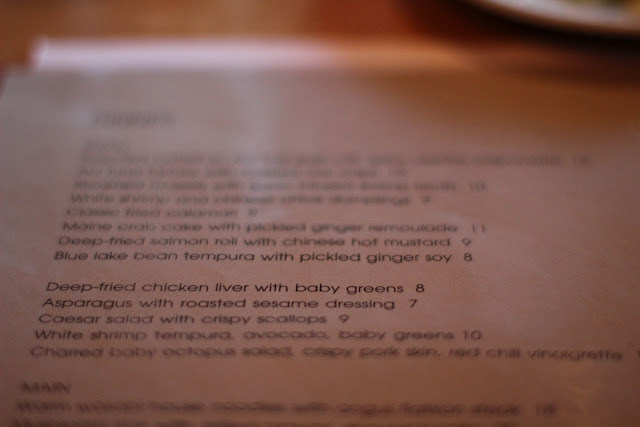 I strongly recommend The House if you're ever in San Francisco and knackering for Asian Fusion food. The restaurant was loud and crowded, and I was told by boyfriend that sometimes the line is out the door, so I would definitely make a reservation one to two days ahead of time. For two entrees and two appetizers we paid about $80, including tip, for large portions and delicious food. I heard numerous remarks around the restaurant that the value for the quality at the House is unbeatable. 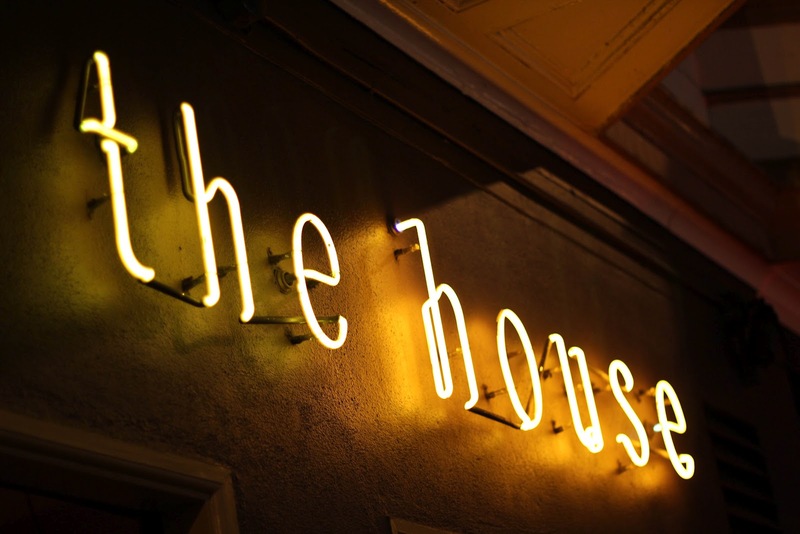 Overall, I would say that my first experience at The House was a delicious one and that I would definitely return here with friends and family. Thanks for coming! Kid Friendly: Yes, saw lots of kids there. Including some that spilled dishes.